I like to make heatsinks. 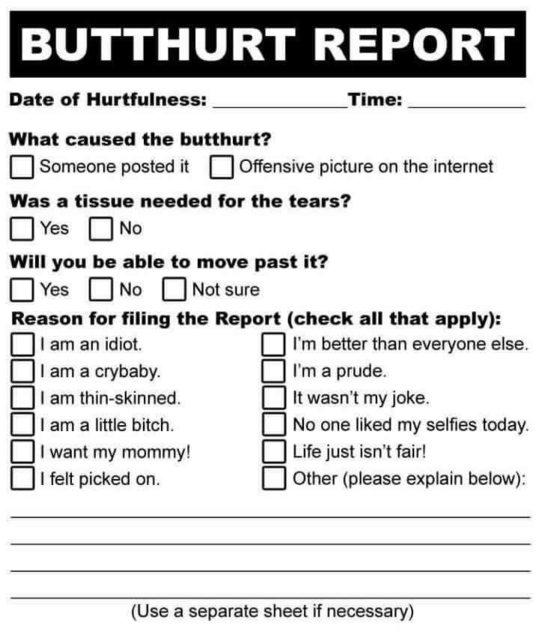 Feel free to make suggestions. To order, shoot me a PM. Prices include USA shipping. International shipping including Canada is an additional $10.50. Available for single emitters and triples. 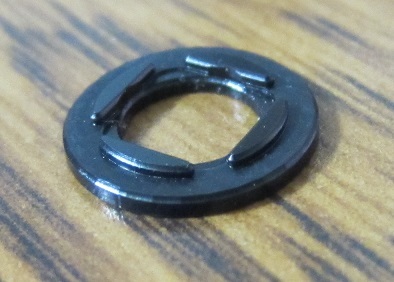 New retention ring version has a large ring that clears the components of two sided drivers. The retention ring is used to drive the heatsink into the light. During removal the retention ring will come out first. There are provisions inside of the pill so that it can be removed from the light. Allow a little bit of extra wire slack so that the driver can be turned sideways for removal. Single Emitter Heatsink: [16mm star, 17mm driver.] | $16 for one, 2 or more $15 each. 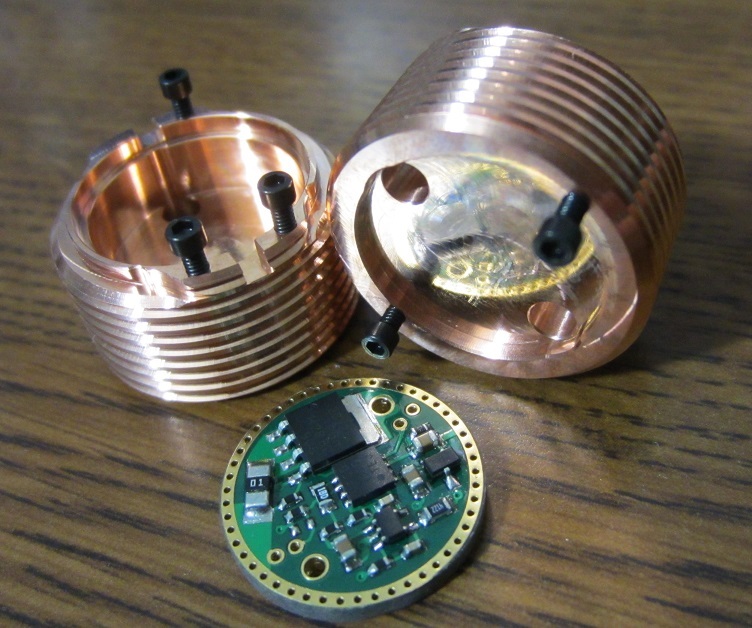 Triple Emitter Heatsink: [20mm star, 17mm driver.] | $18 for one, 2 or more $17 each. 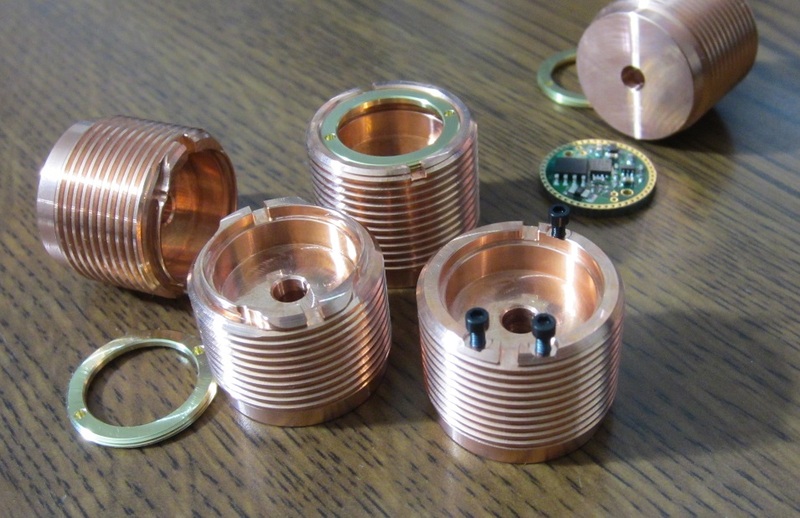 Copper Cometa heatsink: [20mm star, 22mm driver.] | $21 for one, 2 or more $20 each. Note: the MCPCB pocket is very flat. The pattern you see is an intentional optical illusion caused by the way I machined it. 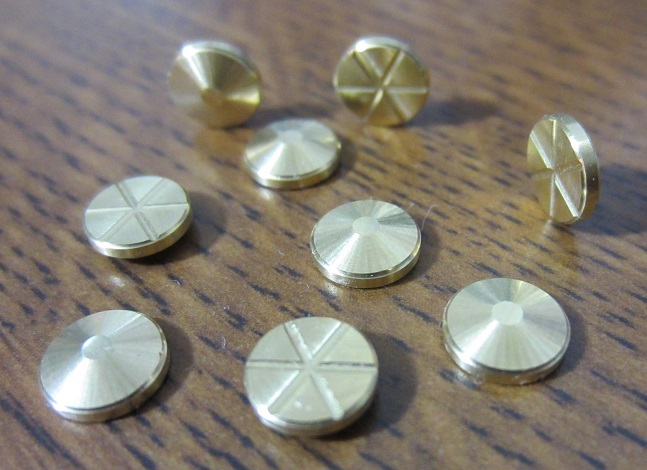 Brass Buttons | .70¢ each + $1 envelope shipping if you only need some of these. Notch features added to absorb solder. The contact side is conical with a .050” flat. Machined S2+ centering gasket for XP emitters | $1 each. Machined Z1 centering gasket for XP emitters | $1 each. Machined S2+ centering gasket for OSRAM WHITE FLAT | $2 each. Includes shim stock for focus adjustment. Machined C8 centering gasket for OSRAM WHITE FLAT | $2 each. I don’t have a need for the others, but a copper D mag sink sounds awesome. Put me down for 1 s2+ cu-sink, thanks. Can you make one for Small Sun ZY-T08 and Courui D01 before you make C8 ones ? Those look wonderful. Does the copper offer better heat sinking than the stock bras pill? Copper is a better conductor of heat than brass so the temperature of an led on copper will generally be lower than one on brass. The highest temp is at the diode junction but improving thermal conductivity shunts the heat farther and faster. Thank you. In that case, put me down for 1 please. Beautiful piece of copper! I don’t have a need for the others, but a copper D mag sink sounds awesome. Good to hear! I hope to impress everyone with my mag heatsink. 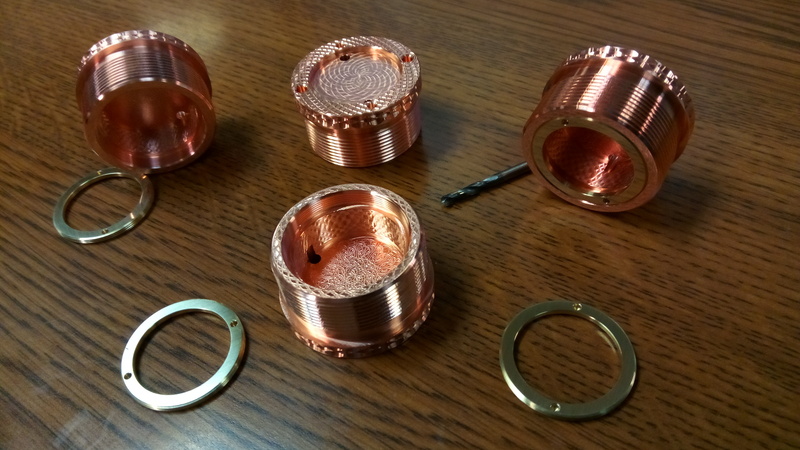 I am currently making the C8’s and have the copper for D01’s. I will look into the ZY-T08 though! Does the copper offer better heat sinking than the stock bras pill? Brilliant job, but why threads are so square? All convoys except of mid-C8 have standart metric 60 degrees threads. Thanks. The Convoy’s do have 60 degree triangular threads, but they are not a standard profile; they are truncated, which is to say the tips are cut off. I measured the pitch, pitch diameter, and the OD of the stock heatsink’s thread and reproduced it, after which point I increased the pitch diameter until the slop went away. Because I did not also increase the outside diameter of the heatsink, the result of increasing just the pitch diameter is a wider crest. There really is a lot of play in the stock threads, and I got rid of it. Now I need to see if they will be too tight for anyone. This is why I am doing a small batch at first. 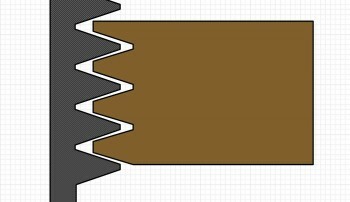 You’ll just have to trust that I know how to make threads, and that I made the only adjustment possible in order to remove most of the slop, which is increasing the pitch diameter. On my S2+‘s (3 of them) these heatsinks install smoothly. They do not bind up or anything. Ok, what is OD of this pills? I`ll take some from the next run. Are you making a triple pill? No plans for triples at the moment. I figure the guys with manual lathes can handle that. I’ll focus on the tricky stuff. Feel free to propose something though and I’ll consider it. Another note regarding the heatsink threads and how they fit: there was quite a bit of dirt and crap in the threads of the heads of my S2+‘s…. I cleaned them all out with a small brush before determining fitment. I’ll focus on the tricky stuff. Maybe you can make SS bezels for good price? Many people would like to have them but they are out of our abilities. Hmm, that might be fun. I do intend to make them for Mags at least. If made from 416SS they can be hardened to better than 36 rockwell C. I would need to get a vibratory polishing bowl and some polishing media to give them a proper finish. Wouldn’t want to see any tooling marks on a bezel. How much is the shipping to germany!? First of all, they look very nicely made! I would really like to see also a tripple version. A shame the International shipping is so high in your country. But with the recent steady development of the driver firmware (great work there), I have no good feeling about permanently solder a driver to the pill. Why not use the retaining ring approach of the original pill? 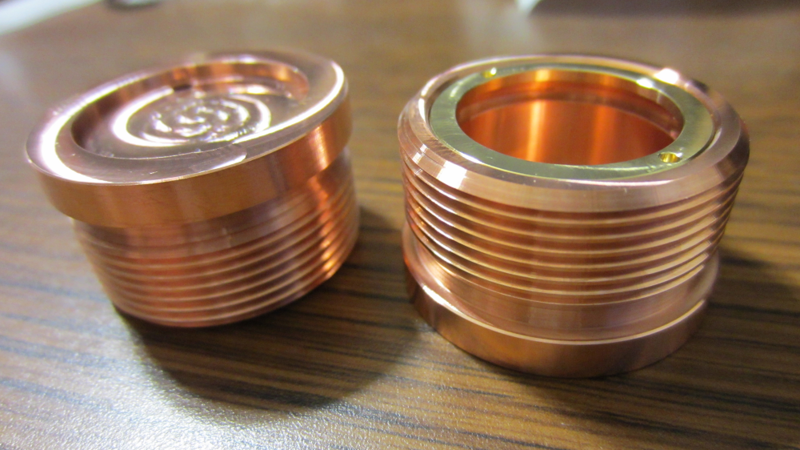 It should be even possible to reuse the threaded retaining ring of the original brass pill. Maybe a internal snap ring could be used to retain the driver, I have done this on my X6 copper pressed in pill, retaining a 26mm Mtn FETDD driver. It was easier cutting a internal ring groove, then making a threaded retaining ring and threading the pill? Just a thought? Could the shelf of the pill perhaps be thicker. I think since a lot of us will be using FET drivers, I don’t think the extra space for the driver is necessary. It would be nice to have even more copper in the pill. BTW, these are absolutely gorgeous! I will look into the ZY-T08 though! I can share its drawing with you if this would make evaluating faster. International ship to Poland First-Class Mail® International Large Envelope** costs 9.20 only. You can put me down for an S2+ also. This pill looks beautifully done, but I already ordered some with spacer from kiriba. Do you have any plans on making a heatsink/spacer for the Cu X5? I am up for one S2+ Cu-sink. 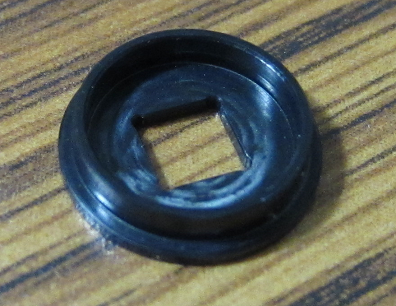 And thanks for the terrific job on the emitter rings just received.